You can add and view available maps at gaiagps.com/map by following these instructions. A List of map categories will appear on the left-hand side of the screen. 5. You can also click the source listing to reveal a details screen containing information about the map source—if you check out these attributes, click the back arrow to return to the list. 6. 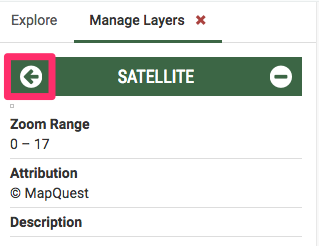 Finally, click on the newly added map source in the Layers menu to select it as visible.